Acts like LUKA put the "sappy" in SappyFest, and that's said with no ill intention. 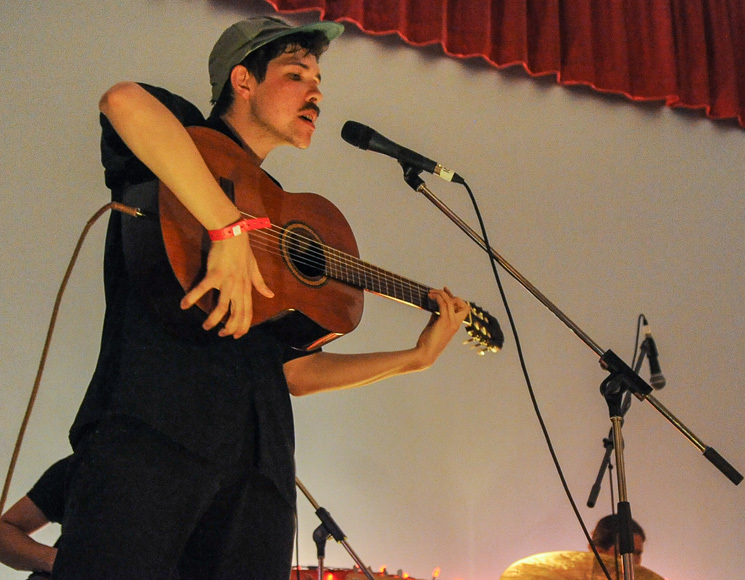 Toronto's LUKA (Luke Kuplowsky and his four-piece band) were settled in on the stage at Sackville's beautiful art deco Vogue Cinema, which dates back to 1946 and provided an impossibly perfect atmosphere for the nostalgic feel that they brought. Romance was spread on good and thick by Kuplowsky and the band; they dished it out by the songful, heavy-handed. Table lamps glowing honey hues stood along the stage with string lights hung just below, outlining the stage and adding to the warmth and ambience of the room. What a neat reimagining of a theatre space, the acoustics of which were stellar, really allowing LUKA to shine — from Kuplowsky's delicate soft-spoken Cohen-like vocals that really draw an ear near, to the marvellously chaotic drum breaks by percussionist Mark Ballyk during certain songs, paired with Sam Gleason's scritch-scratch guitar. Sweetness was at an all-time high, and the sighs, couples canoodling and audible swoons from the quite populated theatre underlined that fact. Along with insightful poetic lyrics that mused about the high and lows of love, Kuplowsky was quick to provide quirky quips like, "This next song is about the baseball cap I'm wearing, it's called 'Quick Reflex,'" to "This one is a little less happy, it's called 'Happy.'" "It's getting very sweaty in here. Bruno, my guitar, keeps slipping. I'm going to slow it down so he stops sweating," he added before heading into "Always the Same Bed" from his 2016 release, Summon Up A Monkey King. That song might've been the most charming of the lot, particularly when backup vocalist Julie Arsenault provided the animal call responses to Kuplowsky's lyrics, "You call to me with the coo of a pigeon, and I reply with the meowing of a cat." "You Can Tell Me Everything" was sweet without being sickeningly saccharine, and "Love Is the Eternal Weight" was beautifully executed, a real mover-shaker with a drawn-out ending that garnered an excited crowd reaction. LUKA ended off the early eve with 2015's "O, My Heart Is Full," which thrilled with starts and stops as Kuplowsky sang, "Sometimes late at night, I get to be talking to my heart. I say, 'Heart, why are you beating so fast? Yeah I've been feeding you right, but sometimes you just keep throbbing, that's not nice, I don't like that. So I get stern with it, and I say stop! Oh and I say go." Suffice to say that everyone left the Vogue with their heartstrings toyed, tangled and cat's cradled with after LUKA's starry-eyed set.